Rafiqun Nabi, a well beloved teacher of the Faculty of Arts, DU, is famous for his brushwork both at home and abroad. With silvery wavy hair, and twinkling eyes behind the glinting glasses, sitting cozy on a winter weekend at the Bengal Café, Dhanmondi, he dwelt on visual art in general. Spicing his words with humour and careful observations, his words ran out like some flowing, cascading river. “I like both painting and printing. Painting is my main subject, which I was introduced to at the outset. When I want to change the media a bit, I go in for printmaking. I did printing before I went to Greece on a Greek scholarship. At the the 'Charukola', I sat at the feet of Safiuddin Ahmed (mainly), Habibur Rahman, and Mohammed Kibria.” R Nabi's teacher in Greece was called Grammatopoulos. What he did here in printmaking was basic. They worked with a sharp tool on the wood. The students also learnt etching on metal with acid. Later on his professor taught him woodcut on a large scale. This was also done cutting away on wood with a sharp chisel. In Dhaka the art student s went from light shade to dark, while in Greece they followed the reverse way. His deep compassion for the underprivileged and disappointment at the growing gap between the rich and poor resulted in the creation of the “Tokai” cartoons, for which he became so famous and which created his other identity as Ranabi. He' d gone on to present his ideas with a large measure of humour in his cartoons–so that his viewers could relish them as well as be provoked by them. How did Nabi get into cartoons? As a student till the mid 6os, there were socio-economic and political upheavals, says Nabi. At that time he used to make cartoons for the processions in the form of direct sketches. Later on printed placards followed. The earlier forms were like doodles. 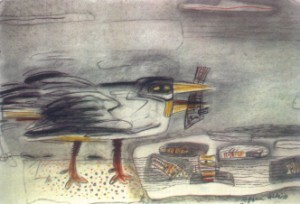 After the Liberation War, and having studied at Greece in printmaking, journalists in “Bichitra “ asked him to continue his cartoons. 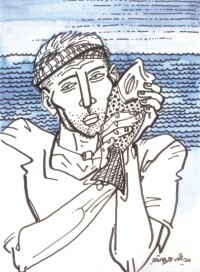 He then began his cartoon strips in pen-and-ink, commenting on the socio-economic and political scenario around him. In them Nabi brought in serious ideas in a nutshell, as he explains. The messages were simple so that ordnary people could relate to them. The master painter also dwelt on what an ideal piece of art must aim at to capture the pulse and rhythm of the people around the artist, or in the mind of the artist – or should the artist please the viewers\ critiques , as he/she must sustain himself\herself and make a living? Do the best of artists have soul-pitch in their work “ The creative artist,” says Nabi “must follow his inner urge. The agony and ecstasy of the contemporary life around the artist must be portrayed. The urge to paint should come from deep within. To whom does he owe his success? What exactly was the backdrop, which helped him form his reputation, skill and personality – which is always mixed and mingled with joie de vivre and ready wit – What was his inspiration and guidance? “ Family background should be there to groom an individual, to encourage a person. My family members, especially my father, Rashidun Nabi, who drew and painted as his hobby. He was a police officer by profession, but he always kept this up. For many reasons he couldn't be a full time, trained artist himself. With his inspiration and support of my mother, Anwara Begum, it was natural that my brothers Rezaun Nabi – who is also a painter, and Shafiqun Nabi a poet and I, the eldest in our family, should go in for something creative–aiming at being significant and unusual. My parents had artistic sensibilities being passionately fond of music and drawing. My father had a large collection of records at that time, in Old Dhaka. Our earlier days were in the district areas, where our father was posted. 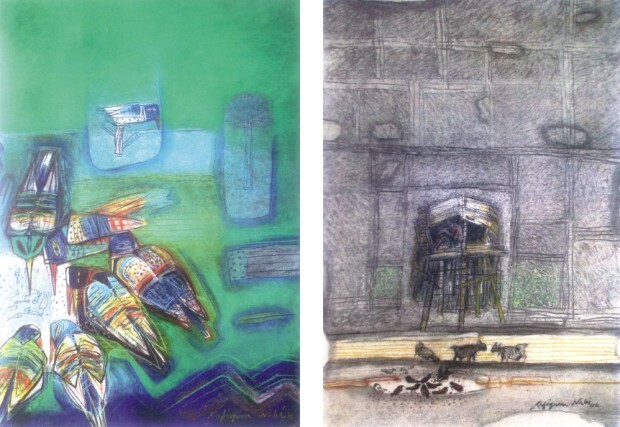 The ambiance, in our home, always encouraged creative work among us children,” says Nabi. “If one doesn't get family support, to be an artists is difficult,” says the master painter and print-maker. Not only did he have an inductive family background – all around him egged him on, he says. Among the artists whom he had the opportunity to know and be guided and encouraged by were the most popular and reputed master painters , beginning with Zainul Abedin. Moreover, there were the finest of our artists like Safiduddin Ahmed, Quamrul Hassan, and Habibur Rahman. Along with them, young teachers at that time – but major artists today – like Aminul Islam,Kazi Abdul Baset, Rashid Chowdhury and Abdur Razzaque , Mustafa Manwar were there too in his time. Nabi says that he was fortunate to have had the cream of Bangladeshi artists to mould him. What more could one have asked for? 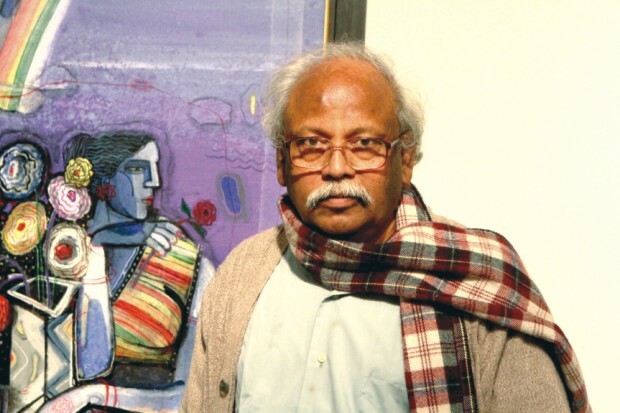 With the highest of the nation's civic awards behind him, and international accolades rewarding his endeavours, Rafiqun Nabi remains one of our finest of visual artists. He remains a highly gifted, self-effacing, warm and wonderful personality of our times.